Dear Apple, any chance you could help get us out of this mess? The record industry has become accustomed to pinning its global annual income at ‘around $15bn’. 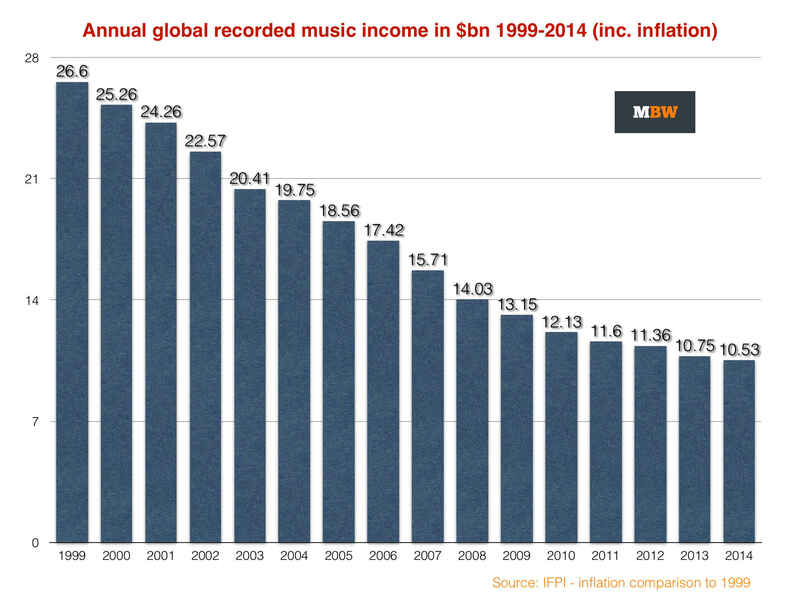 It’s the official IFPI stat from 2014 ($14.97bn, to be precise), and represents a 42% slide on 15 years ago. Most people know it, and say it with a wince. But this data arguably hides a further multitude of sins. 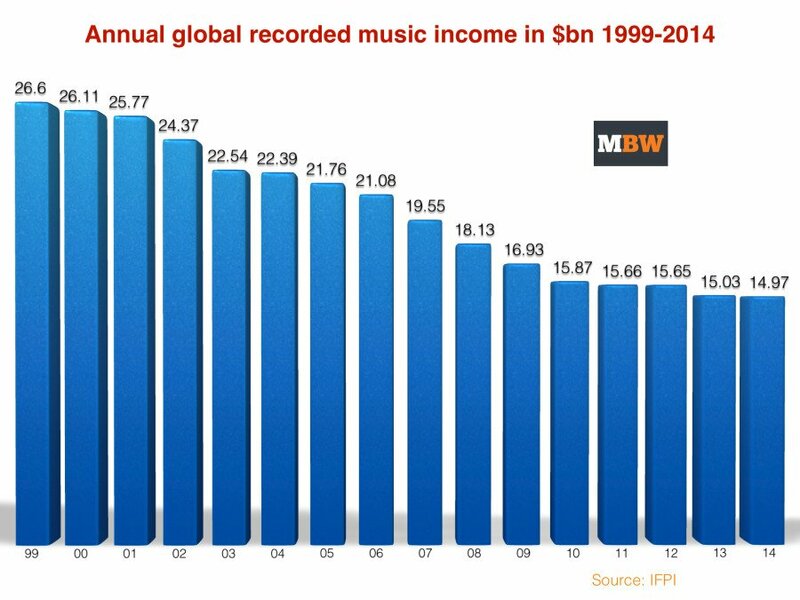 If you apply reverse inflation (US $) to the above graph, anchored in 1999, the truth about the global record industry’s decline in the past decade-and-a-half becomes apparent – and it’s not pretty. Looked at through this lens, the worldwide record industry’s annual income has dropped by a scary $16bn over the past 15 years, representing a shocking 60% fall. In fact, in terms of a dollar-for-dollar inflation comparison to 1999, 2014’s global industry was worth just $10.53bn. Of course, fingers are now crossed for the streaming revolution: when Spotify hits ‘scale’, and if Apple can convert even a small percentage of its customer base, goes the theory, the good times will roll again. To a degree, this makes sense: Jimmy Iovine claimed that Apple Music would be offered free to almost a billion people on iOS devices (not counting the Android app coming later in the year) at WWDC. If 10% of these customers eventually pay $9.99 a month for Apple Music (let’s pretend the ludicrously good/bad $15pm value family deal doesn’t exist for a second), then it will generate $12bn a year – 58% of which will go back to the record industry. But looking at the above graph, here’s the worry factor: iTunes launches in 2003, and the market has declined by almost $10bn at inflation since. Since Spotify’s arrival in 2008, it’s declined by another $3.5bn. And don’t forget that 46% of total income last year came from physical music sales – with 24% of revenue derived from downloads. Apple Music could feasibly hurt both.